“That’s All Brother” C-47 42-92847 on June 5, 1944. 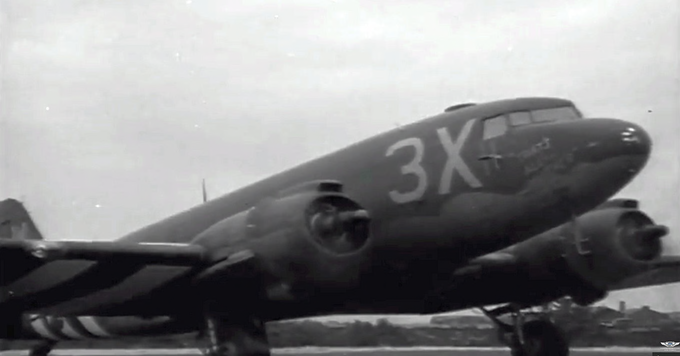 The C-47 42-92847 “That’s All Brother”, the aircraft that led the D-day Invasion on June 6, 1944 will be acquired by the Commemorative Air Force (CAF). “That’s All Brother” is currently owned by Basler Turbo Conversions, a company that rebuilds C-47’s and DC-3’s and replaces their radial engines with turboprop engines. The CAF recently launched a kickstarter campaign and within days the $75,000 goal to purchase the aircraft was reached. With the campaign being open until July 5, 2015, the CAF has stretched its goal to $250,000 which covers the cost of complete restoration to “That’s All Brother”‘s original condition. That’s All Brother C-47 42-92847 nose art.